WEST YELLOWSTONE, Mont. — A total of 600,000 years – that’s the length of time it took for a volcano’s eruption to create concrete, perceivable effects that lasted to modern times. A total of 600,000 years for the lava that at one time ravished the earth to fuel the creation of rocks, geysers and springs. Yes, 600,000 years and you can still feel the aftershock of the explosion’s breath as you watch the world around you boil and churn and change. 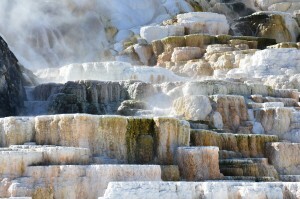 The colorful and steamy terraces at Mammoth Hot Springs in Yellowstone National Park (Staff photos). 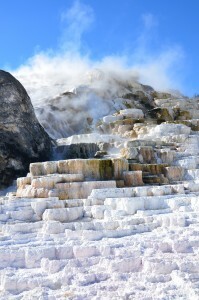 One of these effects is seen at Mammoth Hot Springs, where a volcano’s eruption created semi-molten magma that carries scorching water down layers and layers of terraces. The Mammoth Hot Springs are just one of many sights at Yellowstone National Park that draw thousands of visitors every year. 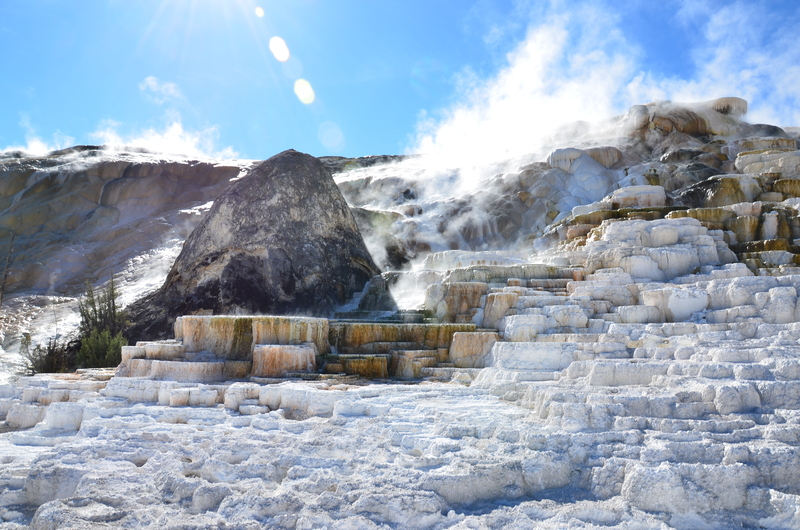 It consists of around 100 hot springs on a hill draping travertine terraces that are gleaming white and masked by a cloud of steam that adds a mystical aura to the setting. One of the most fascinating aspects of the springs is the vivid display of the evolution and cycles of nature, particularly through the flow of the spring’s protagonist: the water. Neighboring rainstorms and snowfalls are absorbed into the grounds where they are put in their own natural oven. The water then moves through an underground conduit, which, due to the cracks and fissures on the surface of the terraces, allows for the hot water to stream above ground. Mammoth Hot Springs’ terraces seem to be a staircase to the top of a hill. “Water … percolates into the ground and gradually descends to depths of a kilometer or nine more beneath the Earth’s surface, where it is heated to very high temperatures and becomes enriched in several chemical constituents. The dissolved chemicals in the deep hot water change according to the composition and temperature of the surrounding rock,” Bargar wrote. Some people assume the springs are drying up, but that is not the case at all – the constant flow of the water from underground to above ground keeps them soaked, which is essential, as it would not exist without that hot water. Limestone, a remnant from the site’s previous layout when it was hidden beneath the sea, dominates most of the surface. 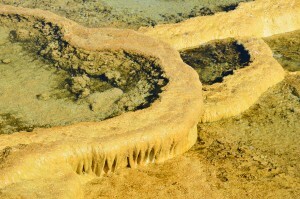 This is unique only to the Mammoth Springs, as the majority of the park is composed of rhyolite. It’s responsible for the ivory color of the rocks, which were sought out by the ancient Bonnock and Shoshone people to create white paint. The hot water dissolves many of these limestone rocks before dispersing between different streams or gathering into one specific spring. Despite the density of all that one sees, only 10 percent accommodates for the above ground material – the rest is all underground. Upon visiting the site, one has to climb a trail up the hill and either travel right or left. Right allows a direct view of the terraces, where you can get close enough to dip your toes into the water. Despite the enticing look of the water, at 165 degrees Fahrenheit, though, you know it’s not the average temperature of your neighborhood hot tub. The other side of the hill, which involves a longer walk, allows you to see them from a higher vantage point. The spot also creates a perfect viewing point for the rest of the park, where golden hills meet perfect azure skies and the length of hundreds of pine trees are visible. Terraces created by travertine deposits combine with hot springs to create a must-see location for visitors to the park. Below, a closer look reveals colors of the site. The park’s busiest months are June, July and August, and most people come for tours. Wild animals such as bison, elk, bighorn sheep, wolves and even grizzly bears can be spotted around the park, though of those, it is mainly the elk that can be seen around the hot springs. However, Uinta ground squirrels and chipmunks can be found darting around the terraces themselves, so keep an eye out for them when you’re visiting. One of the main terraces of the springs is Opal Terrace, which became active in 1926 and is expanding constantly. It releases around one foot of travertine per year into the ground, so much so that a nearby tennis court had to be removed in 1947 because it was obstructing the spring’s metamorphosis. Other important features include Liberty Cap, a cone-shaped hot spring that deposits minerals and the Pallette Spring; a hillside that glitters of brown, green and orange from the algae. 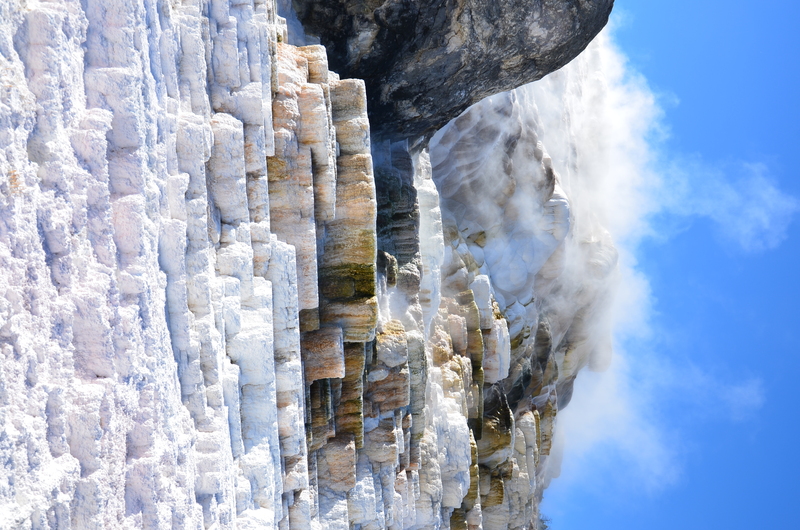 Mammoth Hot Springs, like any living organism, it constantly evolving and changing over time, shedding old skin and growing new layers and morphing into something different every time you visit it.